03.50 Virtual coffee starts. Lisette talks through what she's up to, including her workshop at the NoPants Festival, 9 March 2015. 10.18 Lisette talks through the recruitment process for Happy Melly. 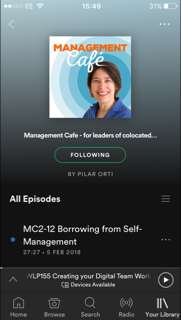 But even if you’re not involved in working with other people virtually or remotely, I think it’s well worth a listen, as she brings up themes that are also relevant to co-located themes. What is important to your team? What are the absolute requirements for someone to join your team? Of course, in larger organisations, there will be some processes to follow, to ensure equal opportunities etc, but in any case, I think even if you are in an organisation where the processes are already there for you to follow, some of the things that Lisette talks about will still apply. What I also found interesting when I was editing the conversation, is that it wasn’t just one person, in this case Jurgen (who, by the way, appears in episode 4 of this podcast), so it wasn’t just Jurgen who heads the organisation that was involved in recruiting but the three existing team members were part of the process. I think that’s also worth thinking about. If you’re recruiting onto your team, be it virtual or not, how can your team be involved in the hiring decision, whether you’re bringing on freelancers, as in the case of Happy Melly or employees. Lisette also talks about the onboarding process – when we talked the new team had only been together for about a week or two, so early days, but again, some interesting thoughts and already some interesting experiments, some of which were successful and others, just as interestingly and as valuable, were not. I’m going to keep this introduction show, because this was a longer virtual coffee than usual but just to say that there is a reference during our chat to an episode on running virtual meetings, and actually, this hasn’t aired yet, and also Lisette talks about sending out a Doodle. This is a very popular tool amongst teams made up of freelancers, who don’t have a shared calendar system, and it’s simply a tool that shows you everyone’s availability. If you set one up, you type in several times and dates, for a meeting for example, and then everyone you invite to it receives a link through which they can add their own availability. It’s very handy and it’s called Doodle. So, as they say on some airlines, I know you have a wide range of podcasts to choose from so thanks for downloading this one and if you think some of what we say might be of interest to a friend or colleague, then do spread the word. I hope you enjoy this episode.